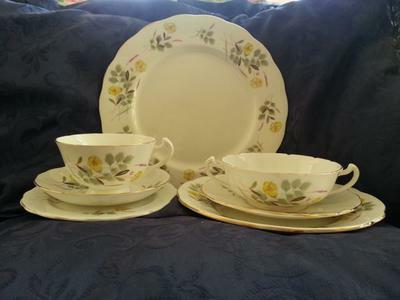 This lovely little dinner set was a present from my husband's Godmother for his 21st birthday in the 1970's. We really love it. Such a gentle pretty pattern of buttercups. It has indented gold edges. It is a 7 place setting with (originall) 6 settings. In relocating it to a new cabinet we noticed a plate had broken in situ. I would love to replace it if that is possible, but that requires identification. It will be my husband's 61st birthday soon and restoring the set to entirety would make an excellent present! 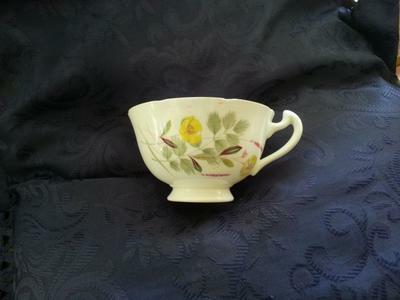 It has no kite mark, no maker's name, just Bone China, Made in England and hand painted an H 1490. Below that is a hand painted angular D, in a different place on each piece although many of the plates lack some or all of the marks. From my little bit of research I see that two of the marks suggest 20th century probably after 1914 and it must predate the 1970's as it was a 21st birthday gift. It was not new when he received it and may have been an inherited set but is just as likely to have been purchased earlier. It is irrelevant to us whether it is old, antique, common, valuable or not, we just love it. I would really appreciate some suggestions. As we live in regional Tropical North Queensland where advice on china, antiques etc is not easily sourced I felt a forum/query site like this would be most likely to be able to help. I don't think this set is from a famous factory as such. I think the blank/whiteware was purchased by a talented amateur china decorator, painted by hand and then finished in their own, or a local kiln. Also, to me, the pottery mark, although neatly done, is also done by hand, but made to look as neat and professional as possible. Does this mean this set you love so much is a one-off and impossible to replace? Possibly. But you can do some Sherlock Holmes detective work - a little bit every day to see if there is anything out there. You will get up a page full of tea sets of a similar vein to your own. Observe that each cup shape has its own unique 'fingerprint'. Note the shape of your handle, the foot of the cup, the wide cup profile and the fluted edge of the cup. Check all the 100's of cup shapes (that's why I say do a little every day). 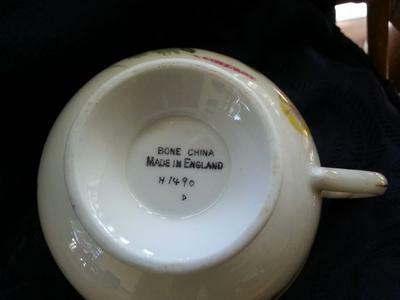 If you find another cup of exactly the same shape you may have at least found the maker of the whiteware. You can then do more searches on the maker to see if it was a standard pattern. Also, you must do the exact same search on eBay (pottery & glass section). Use the quotes in exactly the same search. I just did this and found there were two listings on the UK eBay. One listing showed a cup with a similar shape fingerprint to yours - and this was made by Adderley's of Staffordshire. So this one possibility for your whiteware maker. You need to save this search on eBay and they will then send you an email every time a listing with this description comes up. If you do all this and after a while it looks impossible that you are going to find replacements, why not get hold of some whiteware yourself and get a china decorator/restorer to replicate the pattern?